Cold Fire Creek Dogsledding, was founded by Me, Amanda Sinclair in the winter of 1998. I was 22 years old full of adventure. I started with 21 dogs and 3 sleds, all of which I managed, toured and cared for all on my own. I continued to run solo for the first couple years, until it became too much for me by myself. I hired my first dog handler and tour conductor in 2000. In 2004 I met my husband, Darin Summerhays. I remember asking Darin what I should do as Cold Fire had reached it’s capacity as to how many guests and tours we could take in a day. So we did this together! We acquired more dogs, more sleds, and more guides. In 2011 we expanded once more – and welcomed our first daughter, Jordyn! But we didn't stop there...in 2015 we welcomed our second daughter, Cassidy! Today, almost 20 Years Later, You will continue to find Me, Amanda either guiding you along our beautiful trail or greeting you at the trailhead and giving you your hands on orientation on how to drive a dog team of your own. You would have also most likely already conversed with me via email or phone when making your reservation. Dogsledding is my passion, my heart and soul, I can't imagine not sharing that with you! You will find Darin at the trail head as well. He prefers to tend to the health and safety of the dogs and guests. He makes the lunches, gets us on and off the trail safely, is our home base for radio communication, repairs our equipment and makes sure the trail is free of trees, obstacles and well groomed. Jordyn is now in school, but continues to meet and greet the kids that come on our tours on weekends and holidays. If there are no children she will pick one of you adults to be her buddy, take you by the hand and introduce you to her favourite dogs. 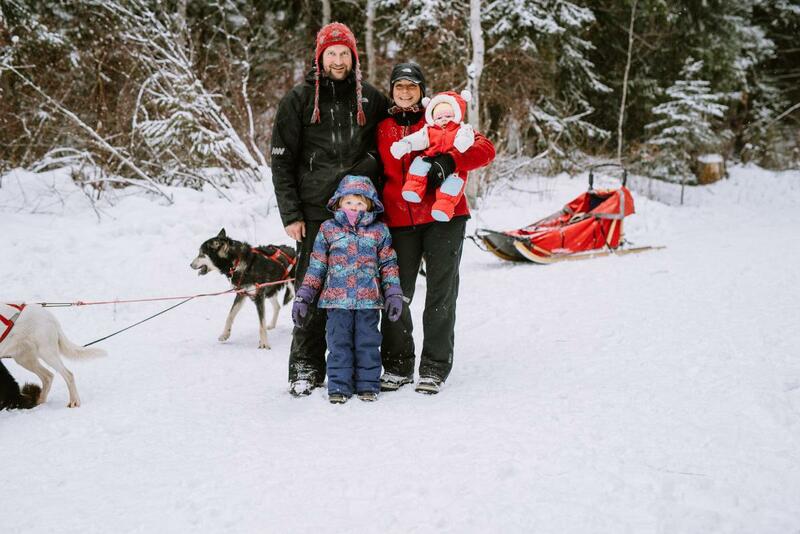 Sometimes she just hops in a sled with others and gives you her take on what dogsledding is all about. " Did you know some of our dogs are from Africa!?" Lol! Cassidy has now taken on Jordyn's initial role of being in tow and at the trail head daily with her dad. We will see what she has in store for us as her personality blossoms!? We have been super fortunate to always have had outstanding Tour Conductors and Dog Handlers. We treat all employees like family and have kept in touch with all past ones over the years. We continue to choose those who showcase a kind heart and love for animals, have good people and organization skills, and have had some sort of either animal husbandry or tourism experience. We require each Tour Conductor to be over 19 years, have a valid drivers’ license, valid first aid certification and have taken avalanche safety training. Dog Handlers are required to be organized, tidy and love love love dogs! If you are interested in Joining our Team, please email us your resume with cover letter.